Back in 2003 when I was DJ'ing on college radio, I befriended New York City hip hop artist Tribeca, who was on the appropriately titled Major League Entertainment imprint. 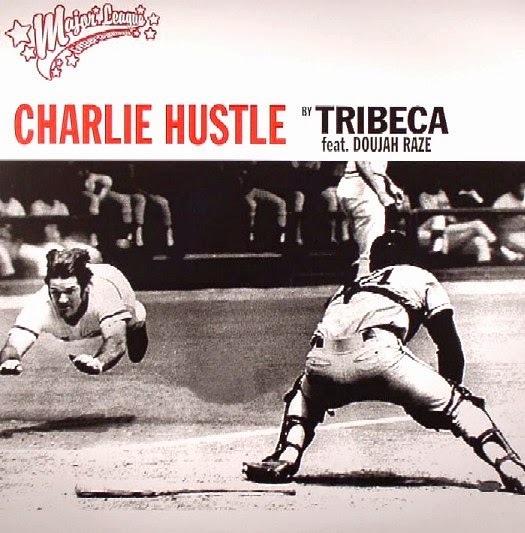 The label was known for their attention grabbing sports inspired record covers, including one major tip of the cap to Mr. Pete Rose aka Charlie Hustle. Tribeca - Pony Express (Charlie Hustle) 12"
Tribeca's "Pony Express" (Charlie Hustle) makes a heartfelt case for Pete Rose's enshrinement in the Baseball Hall of Fame that is not only a timeless tribute to the all-time "Hit King," but one that fans can appreciate regardless of their musical tastes. It doesn't absolutely have to be a simple 51% Passing grade could be 65%, whatever. Maybe by 51% majority or 65% Super-majority fan vote? After all... THEY are the ones the records are published for? It will be interesting to see what the new commissioner does regarding his eligibility.